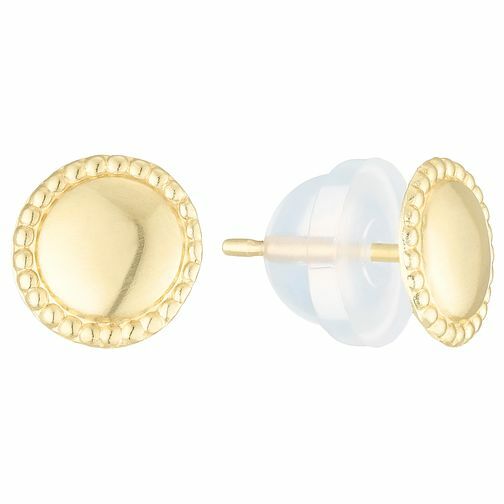 An elegant pair of round stud earrings, finished with pretty milgrain edging. Crafted in 9ct gold for a classic feel. 9ct Gold Milgrain Edge Round Stud Earrings is rated 3.5 out of 5 by 2. Rated 3 out of 5 by Anonymous from AVERAGE QUALITY The earrings are extremely small & fragile, disappointed the earring backs were plastic and not gold,- this gave the earrings an appearance of inferior quality. I read you could not return the earrings if the seal had been broken, but the sticky label telling you this info was glued over the small plastic packet.... You had to split the label in order to see the earrings, therefore breaking the seal? There must be a better solution to this packaging?